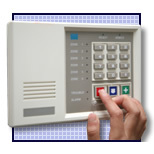 We supply a full range of intruder alarm systems. 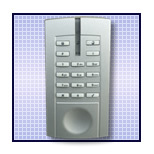 We can provide an intruder alarm solution for every circumstance and for every budget. From a reliable "bells only" alarm to a 24 hour monitored intruder alarm system, each type of intruder alarm is designed to suit each customers needs. We only use alarm products supplied by the leading manufacturers ensuring a quality alarm system installed by knowledgeable engineers. (Association of Chief Police Officer's Scotland), PD; 6662 and also the new grade of systems, Grade 1, Grade 2 and Grade 3 all installed to EN; 50131 - 2004. Security Alarm Systems will protect your home or business, from the unwanted attentions of intruders and is of the upmost importance, in the first line of protection. Many householders and businesses may feel the intrusion to the home and property, but the serious financial loss a break-in may have and the full implications that a break-in may incur are not realised, until it's too late. 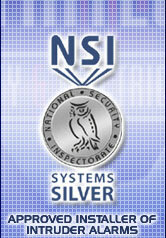 Have a "Security Alarm System" installed and maintained by an "NSI Approved Professional Installer" this is the first step as it acts as a deterrent to any would be intruder and will alert either yourself, neighbours, staff or if the need required the police, but be sure to have an alarm system that you require, choice is important. When you choose our company to carry out the installation or servicing of your security alarm system, you will know that we are properly vetted t British Standards, fully insured, operate a 24-hour call out service and will respond to you within 4 hours. That's why it's best to always choose an approved alarm installer.